ost (if not all) of Batman's biggest foes were free due to Bane's destruction of Arkham Asylum. The first of the criminals to attack, the Mad Hatter, was taken down by Batman and Robin at a tea party. Bane killed Film Freak. Amygdala was next for Batman. He then took down Zsasz at an all girl's school. Robin was captured by Bane, but Killer Croc attacked them both in the sewers. Robin escaped, and Bruce got a little rest. Batman saved Gordon from Cornelius Stirk (controlled by the Joker). Scarecrow and Joker attacked Mayor Kroll. Robin got a tip on Firefly, and Batman went for him (but he escaped for the second time). Bruce Wayne, though faking the trance, along with all the other guests at a charity event are taken by Poison Ivy. Bane realized that Batman is Bruce Wayne. Jean-Paul went out solo. The police began a wild-goose-chase to locate the kidnapped mayor. Batman and Firefly went at it again, this time Batman the victor; the Riddler took over a live tv show, which was foiled by Robin. Scarecrow and Joker began bombing an under-river tunnel. Batman saved Mayor Kroll, but the tunnel gave way to the river. He was ambushed by Bane's three partners, and defeated them all. Upon arriving at Wayne Manor, Bruce found Alfred passed out on the floor and Bane standing above him. 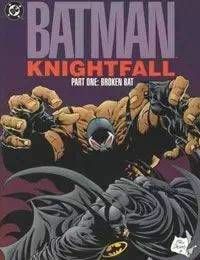 After putting up a weak defense, Bane simply lifted Batman above him and brought him down on his knee - breaking him.